A breezy mix of custom and vintage pieces, many from Argentina, populate the living and dining areas. 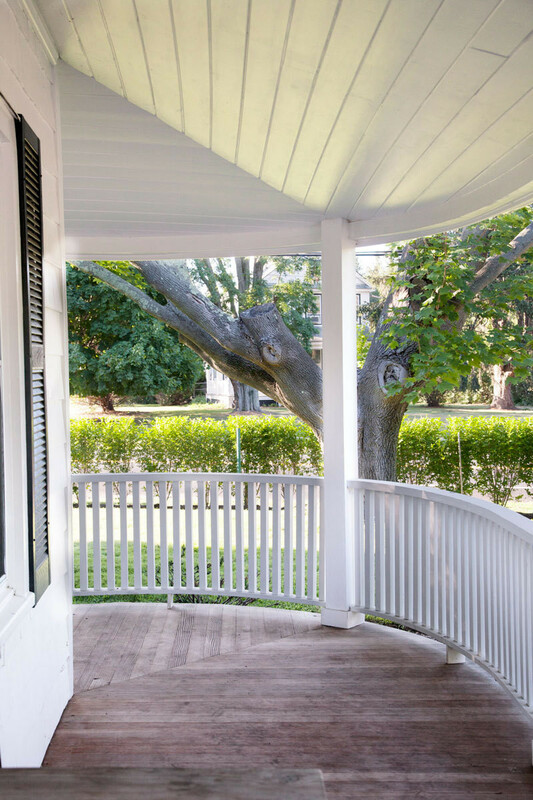 The home's wraparound veranda was added early in the 20th century. Jennifer Webster and Zsolt Juhasz Buday are nothing if not skilled in the art of multitasking. The couple leads an international lifestyle that involves juggling individual and joint projects on different continents. An architect and set designer, Buday met Webster in Budapest, where she was launching a production company in the late ‘90s after leaving her job at a prominent New York City advertising agency. In 2003, the newlyweds bought and refurbished a home in Buenos Aires; to capitalize on their growing experience as renovators, they founded an interior design and architecture firm called the Alchemists. Along the way, they also had two children, Sophie and Felix, with whom they spent several months in Hungary each year. A decade after moving halfway across the world, the couple was ready for another big life change. “Zsolt is Hungarian, and I’m American,” says Webster. “We wanted to get back to our roots and cultures.” The family decided to spend the school year in Hungary and summers on the East Coast—eventually setting their sights on Greenport, on the North Fork of Long Island. The historic seaside village, with its quaint shops and small-town diners, is a favorite with both vacationers and young families who reside there year-round. “It has a summer scene, but it’s also wholesome and down to earth,” she explains. 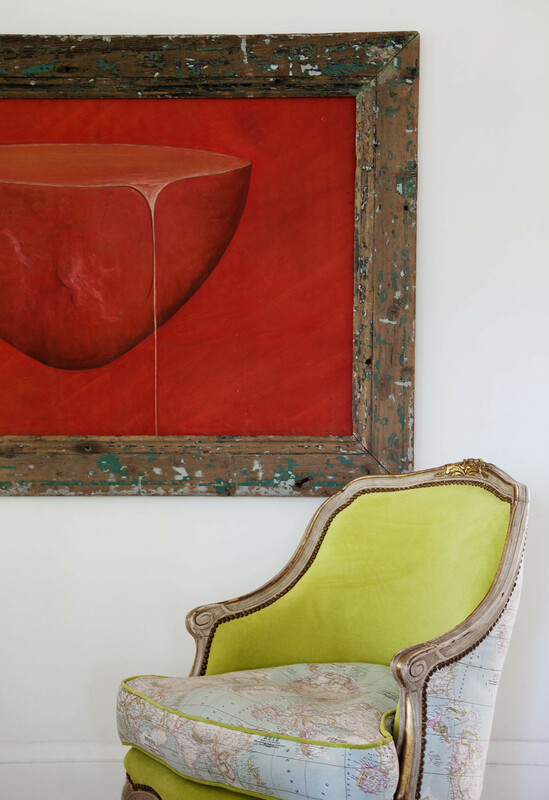 An antique chair reupholstered in map-printed fabric and acid-green velvet looks even more compelling next to a deep-red painting. Webster and Buday were still living in Buenos Aires when they saw a listing for an 1850s farmhouse near the beach. “I fell in love with the south-facing orientation and the big lawn with its massive wisteria,” Webster says. 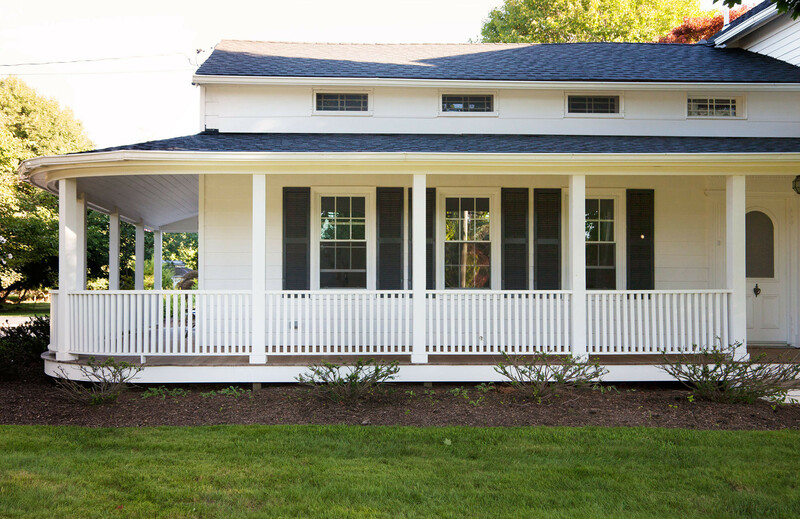 “We bought it over the Internet and didn’t see it until the day of the closing.” This was late 2013, and the months that followed were a whirlwind of activity as they packed their belongings in Argentina while planning double relocations and directing the renovations of a 160-year-old home, mostly from afar. (“It was a totally insane period of time,” she admits.) The family filled two shipping containers with furniture: one for their apartment in Budapest, and another bound for Long Island. A detail of the wood-topped prep surface. 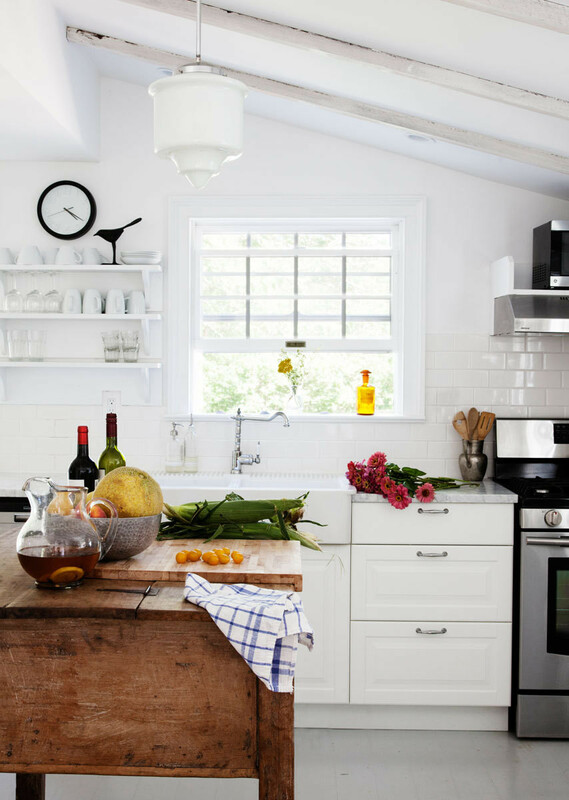 An old baker's table serves as the kitchen island. 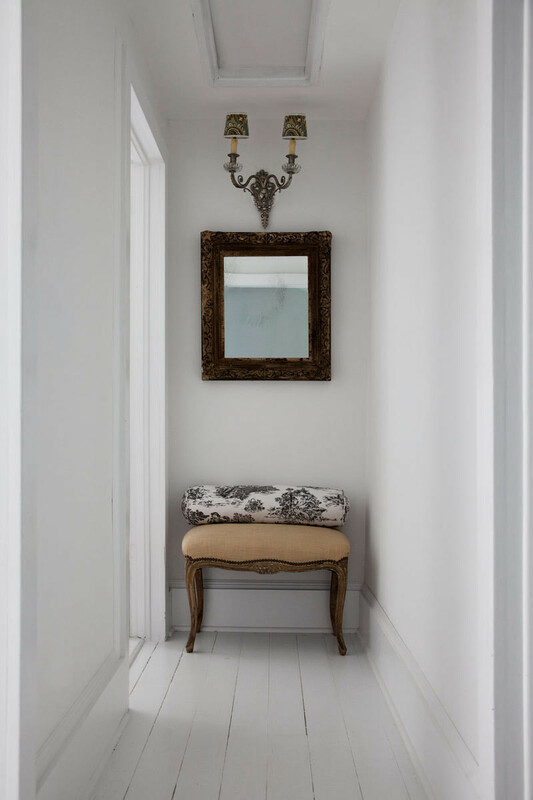 The mirror, sconce, and bench were all found at the Buenos Aires flea market. Buday designed cubbies for the kids' beds to maximize the low, sloping space. When they arrived in Greenport last summer, the work was nearly complete. The basic structure of the four-bedroom residence was preserved, but a few internal walls and doorways were opened to reconfigure the flow of the space. Almost every interior surface, including the wide-plank hardwood floors, was painted white, giving the house a summer-cottage atmosphere. Materials used to renovate the bathrooms and kitchen—also in white—came from retailers such as IKEA and the Home Depot. “I don’t think decorating should be expensive; everything is economically minded in our house,” says Webster. Several of the furnishings that arrived from South America—a mix of secondhand and made-to-order pieces—are displayed in the spacious living and dining area. 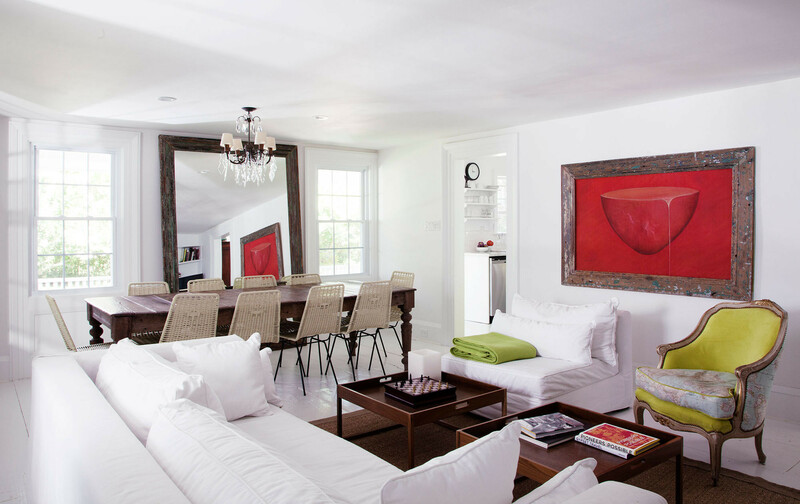 One side of the room is anchored by a large rectangular sofa and matching chair covered in white denim, a fabric that Webster has used many times for its durability and washability. There’s also a Louis XV–style chair partially upholstered in an acid-green velvet that Webster isn’t too enamored with (“I think it’s little bit much,” she quips), although it creates a compelling juxtaposition with the large red painting behind it. The vintage dining table nearby, which sits 10, was purchased from a restaurant in a small village outside Buenos Aires. The chairs that surround it were custom-made in Argentina by weaving spaghetti wire onto iron frames. 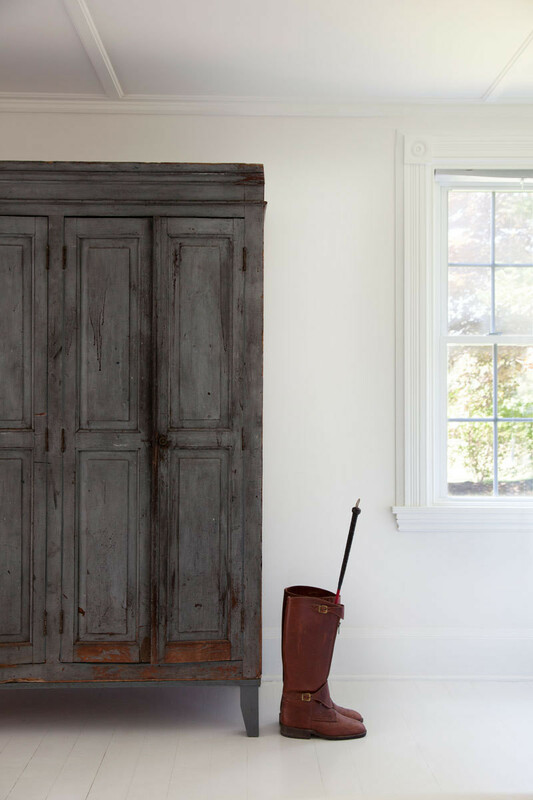 The old armoire was shipped from Argentina. The guest bathroom features a tub with generous views. 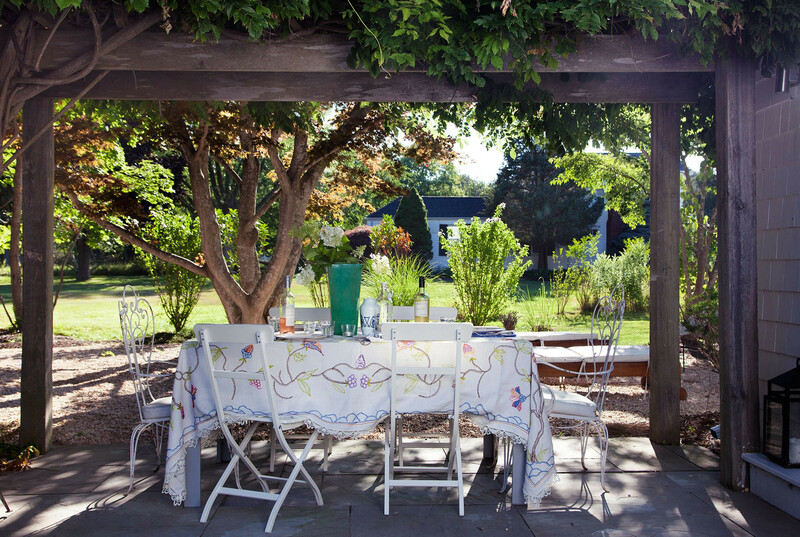 A trellis covered in wisteria vines provides a shady spot for casual meals outdoors. 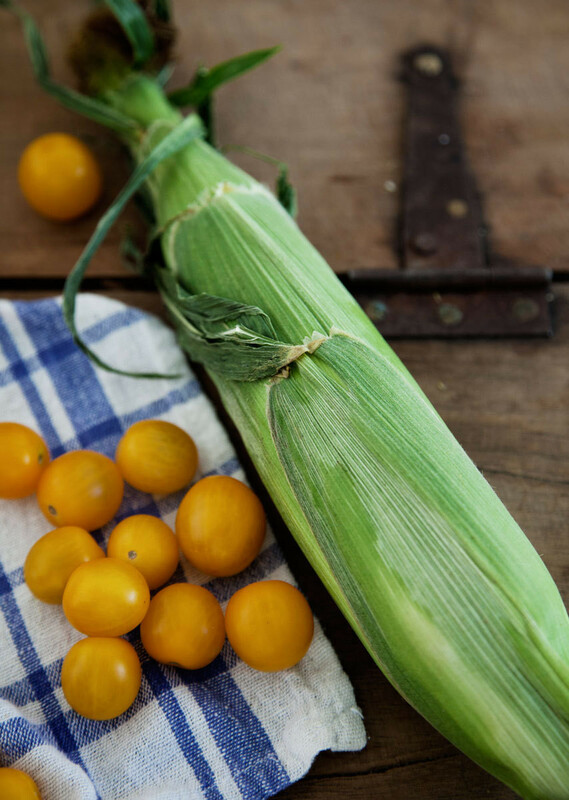 The 19th-century farmhouse, in the quaint seaside community of Greenport, is classic Americana at its best.